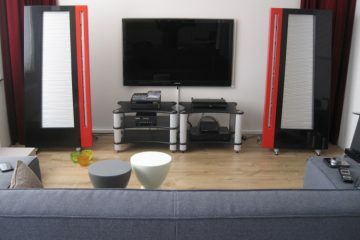 Reviewed here are the Speaker Cables. Also see the AudioQuest Interlinks review. The speaker cables were all newly fabricated so in order to be certain to hear them at their best I connected them to the secondary system and played music for the majority of the day for at least a week. The 3 cables were connected successively, so this did take some time. I am not sure if 1 week is enough for these cables, but I must say that I did not hear a whole lot of difference between the very first moment of connection and the sound 1 week later. It is said that this is actually a function of the DBS system. If so, then this means a massive time-saving for reviewers or persons that like to maintain several cables and swap them at times! In any event the biggest difference was in the amplifier warming up during the first hour. 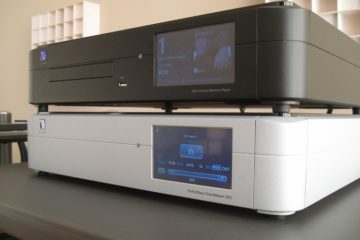 Amplifier used was a Devialet 120, which is handy because it is a streaming endpoint, DAC, preamp and power amp all in one. In the interest of keeping things neutral I am streaming from a Windows PC using the Devialet’s Air protocol from jRiver Media Center. So you see, there’s nothing to tweak here. 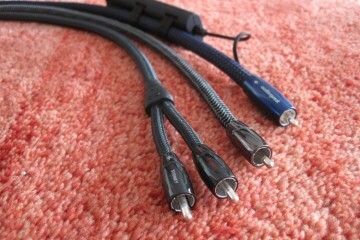 The AudioQuest cables are the only cables in the chain, apart from the Devialet’s power cable and the Ethernet cable. 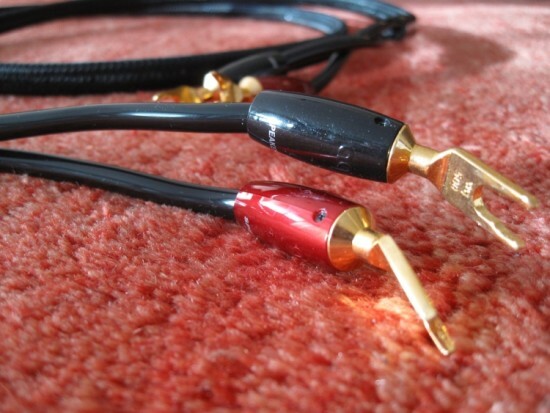 All Audioquest cables are available with a range of connectors and I received gold plated versions for the GO-4 and Rocket 88. The Castle Rock was provided with silver plated connectors. All cables tested utilize solid Perfect-Surface Copper+. 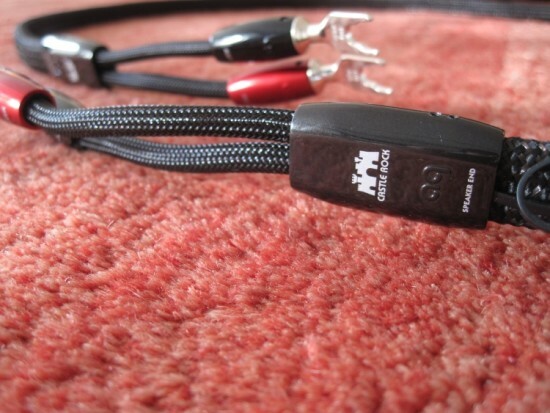 The GO-4 is the simplest cable in this review line up but it is not AudioQuest’s most affordable cable – there is another more modest model above, and even cable off the reel that can be purchased per meter. I didn’t want to explore that area though, I found it more interesting to see what the better cables could do for my system, while keeping the starting point at a level that I think any serious music lover would be willing to spend. The GO-4 employs a star-quad geometry and uses partially conductive Carbon-Loaded Polyethylene in the insulation for the negative conductors and Nitrogen-Injected Foamed-Polyethylene Insulation on its positive conductors. 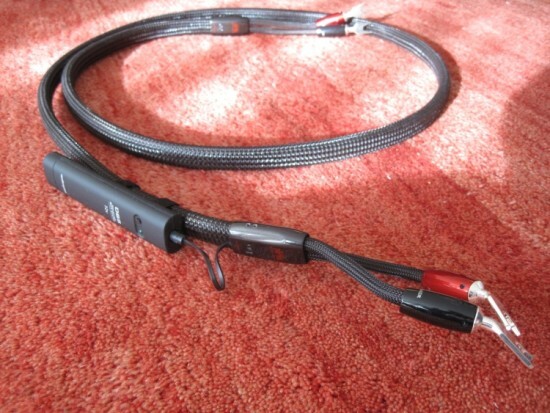 This is a very neatly finished cable with the familiar warm and understated Audioquest braid, excellent spade connectors with stylish housings and first grade splitter ends. And it has the trademark AudioQuest 72v DBS bias system. There really is nothing about this cable that gives away its affordable price point. To my surprise it also sounded very good right from the start. Not that I expected nothing from this cable, but I should state that I have heard mega-bucks cables with these speakers and from what I could tell initially, there was no immediately apparent area in which the GO-4 dropped the ball. The GO-4 uses solid core conductors, and true to earlier experiences, this translates into a solid, upbeat bass and a lifelike midrange. The surprise for me was mainly that the cable managed to retain the lush and relaxed spaciousness as well as most of the treble air that I was used to from hearing with litze (stranded wire) cable designs. Importantly there was no square-ness to the bass, something that can happen in this system when bass is portrayed very accurately. This is not to say that the bass wasn’t precise because it actually was very nimble and dynamic and very articulate. It’s more that it sounded colourful and retained a sense of fulness and body along with it. Lastly timbre was spot on: very very natural and life-like and, this was another surprise for me, without any harshness. 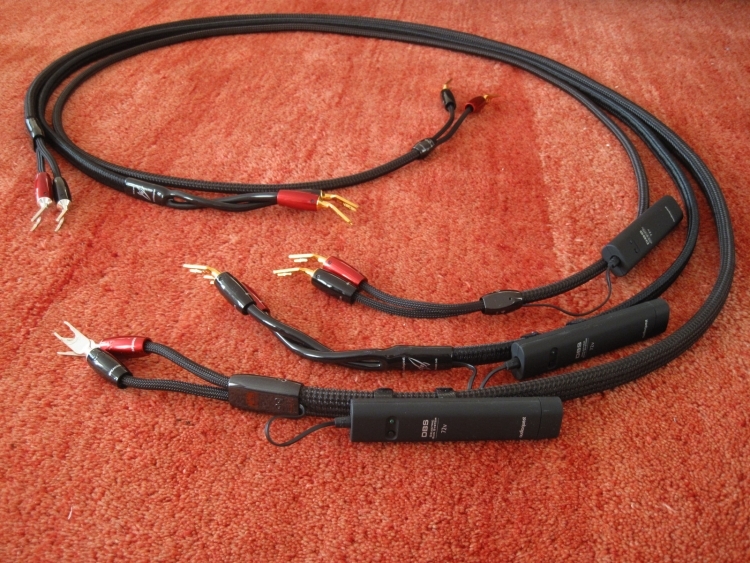 Even cold from the box, all the AudioQuest cables simply refused to sound harsh or shrill. 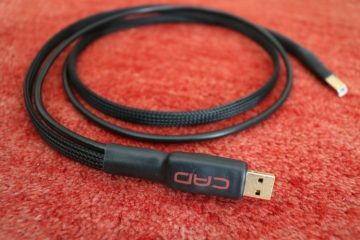 I have heard many cables in this price range and well above, and I can honestly say that the GO-4 would not only be the perfect level-up cable to start with, it is so good that there is no hankering for more, unless one starts comparing cables directly. 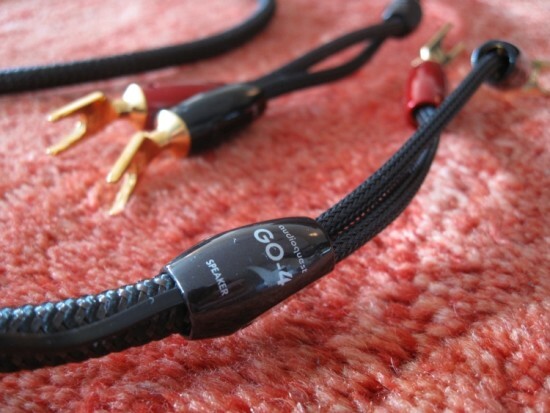 The GO-4 is a very musical cable that manages to sound forgiving while providing more audiophile qualities than I’m used to hearing at this level. The Rocket 88 is the top level cable it its series. It employs a double star-quad geometry and uses a double amount of copper compared to the GO-4 and is noticeably sturdier and heavier. Like the GO-4, it uses partially conductive Carbon-Loaded Polyethylene in the insulation for the negative conductors and Nitrogen-Injected Foamed-Polyethylene Insulation on its positive conductors. It is the only cable of the bunch to have a PVC trouser-sleeves in place of a solid splitter and braid, likely applied for the cable to still reach a certain price point. I mentioned the perfect timbre above for the GO-4 but the Rocket 88 manages to put some extra on top: this cable sounds even more natural, life-like as well as live-like, by which I mean the feeling of listening to live musicians. Also the 88 has bass to die for. Regular readers know that I like solid bass, Levinson and Wadia style, and it was this aspect of the 88 really made me fall for it. It’s deep, solid and powerful, while remaining nimble and articulate. Midrange was even more tangible, most noticeable with piano which was way more real than with the GO-4. Here I was thinking that the GO-4 could be my next default go-to cable for this setup. The Rocket 88 does have a darker balance than the GO-4, and is definitely drier. It also seems to be less spacious, but the cable does offer plenty of detail throughout the frequency spectrum. The Rocket 88, even more so than the GO-4, made me feel as if I got the Accuphase E260 bass back. 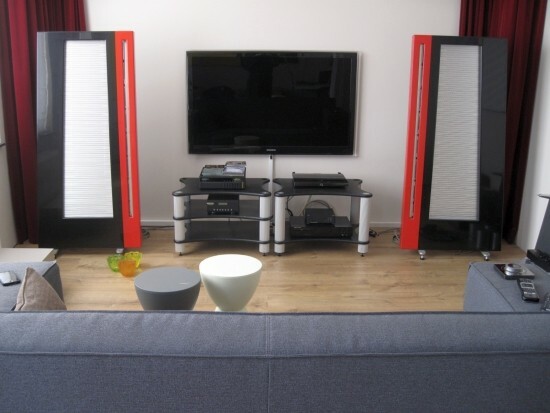 The Devialet is more refined and airy for sure and it has excellent bass, but the Accuphase was simply fuller and more sonorous in that area, and the Rocket 88 seemed to give me the best of both worlds. There was however also a less ideal quality to this cable that I couldn’t quite put my finger on, but that ultimately made me like the cable less. I think it is best described as a lack of free-flowing music, the inability to really reach out lyrically and sing. It isn’t speed related per se, as the sound wasn’t slow in itself, but it did seem that the musicians weren’t really in the mood. The sound itself was technically very good, but the performance wasn’t engaging me much emotionally. In order to be sure of this effect, I repeated tests with several friends and with a length of time in between sessions. The end result is the same: even if I really like this cable in most of its areas and it makes a clear case for being superior to the GO-4, ultimately for me it drops the ball in terms of musical flow. Castle Rock is the entry level cable in its series. 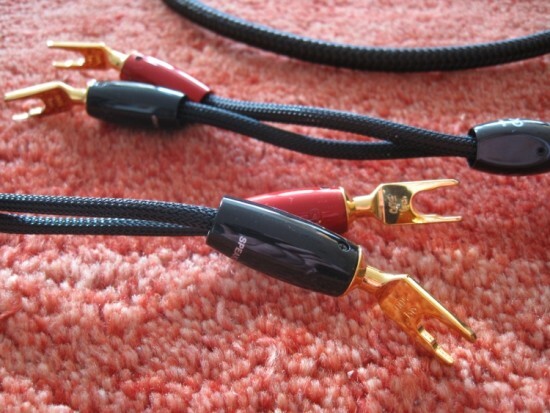 As the only cable in this review line up, this cable was provided with “Hanging-Silver” 1000 Series Multi-Spades. 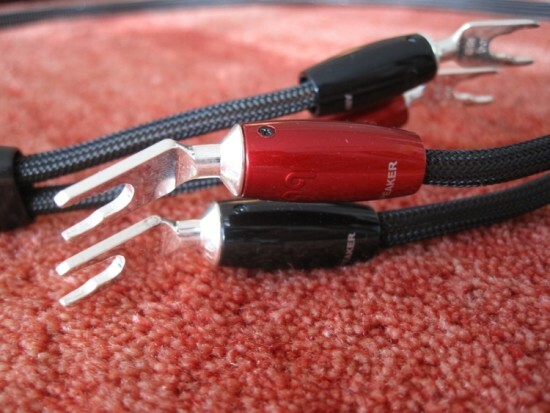 Originally developed for the WEL Signature Series speaker cables, these plugs are made using a “hanging silver over pure red-copper” process in which the spades are submerged (“hung”) into a vat of extreme-purity silver, resulting in a very thick direct-silver plate. No intermediary performance-degrading materials (such as nickel or alloy) are used. Apart from the connectors though, it employs all the same techniques as the Rocket 88 and to be honest it isn’t clear to me where it should be superior. But as more often happens, the devil is in the details, and as it would turn out the Castle Rock really is in another league compared to the 2 cables listened to before it. Like the Rocket 88, the Castle Rock provides rock-solid, deep and powerful bass. Compared to the already fuller souding Rocket 88, the Castle Rock sounds even fuller tonally. Yet it doesn’t sound heavy-handed at all. This cable simply sounds perfect in pitch and tempo: neither slow nor hurried, and its dynamics are spectacular, without ever becoming harsh. 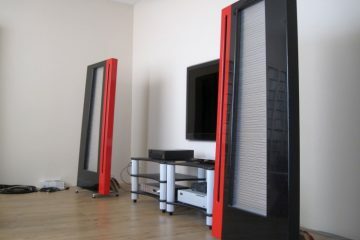 Soundstage is definitely wider than with the Rocket 88, and contrary to the latter, the Castle Rock easily fills the room with an enveloping sound aura and music flows freely from the speakers. Piano and percussive instruments sound ever so lifelike, and very LIVE. It’s not often that I hear a cable that sounds so energetic without hardening even the slightest bit in dynamic crescendos. As I was happy to note, the Castle Rock also improves on the Rocket 88 in terms of treble air and -flow and even if its solid core nature will not make the cable sound like the airiest of competing litze designs, its balance is just what the doctor ordered for this setup. More importantly, litze designs are not normally capable of delivering this level of solidity or the well-grounded lifelike quality that the Castle Rock is capable of. Lastly, I mentioned in the Rocket 88 alinea how the cable made me feel like the Devialet 120 had attained part of the Accuphase E260 bass, and luckily this also goes for the Castle Rock. What’s more: the Devialet 120 now sounds more like I remember the Devialet 200 to sound, but without the latter’s overt control and slightly forward sound. These days it seems that many audio companies are improving their products toward a common goal: a technically ever more precise sound, usually tilting toward an ever brighter sound, with very explicit treble. Often this technical excellence comes the expense of musical enjoyment, especially with less than ideal recordings. 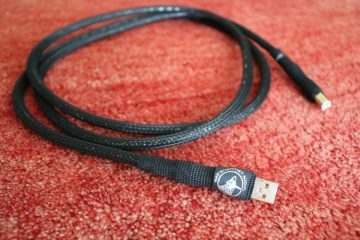 Going by what I heard from the three cables reviewed, Audioquest threads a different path. I think I can safely summarise the current AudioQuest house sound, for loudspeaker cables at least, as being solid, natural and powerful, with a full tonality and a refreshing lack of treble brightness. Even the brand’s very affordable GO-4 exhibits these core qualities . It is so good that it is easy to conclude that there is no need for the dearer cables, until one listens to the models above, and then there’s no way back. Castle Rock takes the GO-4’s qualities and adds to every single aspect of it to combine into a cable that at its price level is perhaps not within reach of all music lovers , but certainly is the best cable I heard in years regardless of price, and therefore comes highly recommended. Dank voor deze review! 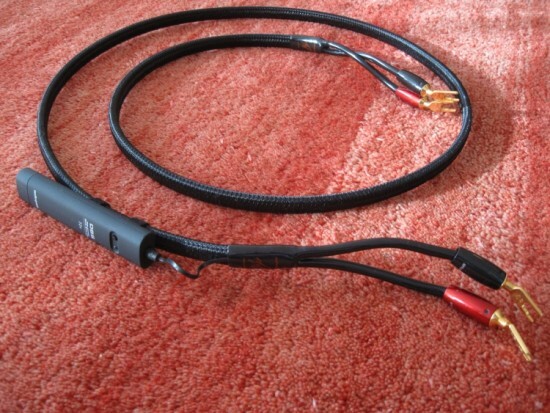 Ik was al langer aan het nadenken over een nieuwe speakerkabel en op basis van jouw positieve geluiden over de Castle Rock heb ik een demo daarvan aangevraagd. 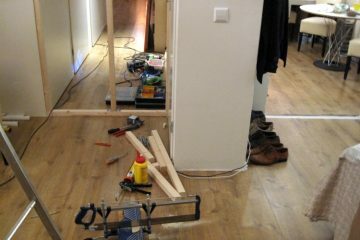 En vervolgens was maar één conclusie mogelijk: steengoede (pun intended) kabel die mag blijven in mijn set! Good to hear, thanks Dennis! Thank you for this wonderful review! I would appreciate your opinion regarding the GO-4 vs. the budget champion: The Van den Hul Skyline Hybrid. Thanks! Skyline Hybrid is a different price category and has a completely different sound. Most obvious difference is in the frequency balance where the vDH is tilted towards the treble and the Go-4 is titled toward the bass. Both cables sound quite transparent to me despite the obvious tonal differences. Whichever is the better match depends on your (system’s) needs. The Go-4 is the more audiophile choice with more natural timbre, sharper transients, more articulate bass and better focusing. The vdH however has more open treble and sounds more fluid and airy, and has lighter, less solid bass. 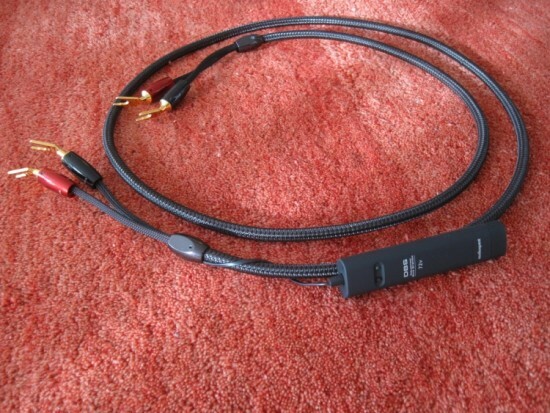 I had the Audioquest Castle Rock speaker cable on demo at home. I found them full bodied and on the warmer side of neutral, which is what I’m looking for, but found them too forceful, too forward, spotlighting certain areas and making the sound more artificial, but that’s only my opinion of course. 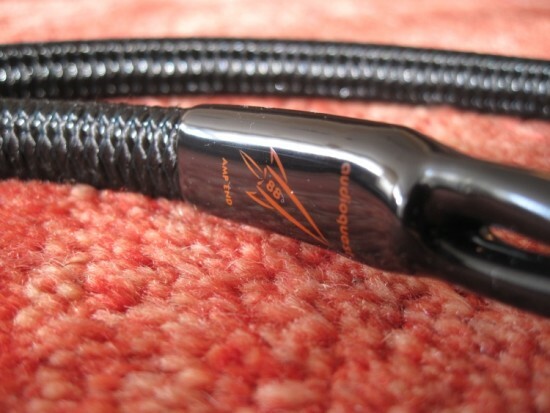 I like a speaker cable that is even across the whole frequency range, full bodied, relaxed, a bit on the warmer side. 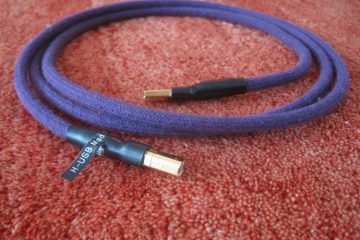 Would the Ricable Supreme speaker cable be a good candidate? Thanks for your advice. Merry Xmas! 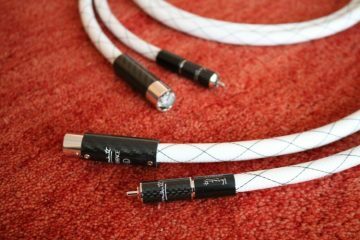 The CR is a very detailed and articulate sounding cable that avoids the tonal blandness that often occurs with very detailed sounding cables. After having had the cable in my system for a longer time however I also find that it can be a little too powerful in the midrange, at least in the context of some systems. I imagine that the cable would work very well when combined with many English speaker brands that have a warm, smooth midrange. The Ricable sure is smoother and more relaxed, musical and quite even sounding, but if you’re used to the detail, focus and transparency that the CR provides then the Ricable may disappoint on that level. I think you may need to look further, and for your system and taste perhaps avoid solid core cables and go with stranded ones. Usually, all circumstances being equal, the more and the finer the strands, the smoother the sound. Also note that PE and Teflon tend to sound cleaner and relatively more forward than for example PVC. Thank you for your feedback. I find the detail, focus and transparency if the CR too much of a good thing. 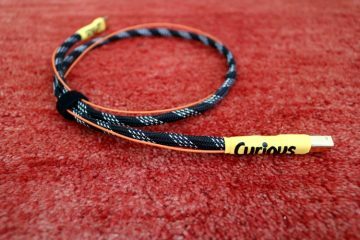 That’s why I thought the Ricable cable to be more my taste. I’m not looking for so much detail and transparency, but softer, more rounded, full bodied and more musical. Does that sound like Ricable? Detail need not necessarily be presented in a forward manner. 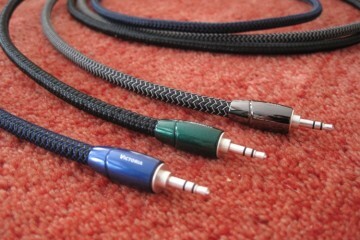 In other words, there are also cables that are highly detailed but without being hard in the midrange. Most of them are more expensive than the AudioQuest. Whether the Ricable is the better cable for you I cannot say for certain, but it is indeed gentler, and you may well find it to be more musical indeed. Note that I reviewed two versions Ricable, one smoother and the other more precise. You may want to try the smoother one first. Thank you. I was thinking of the Ricable Supreme speaker cable. Is that the one you mean? Yes Supreme, or the Hi End. I did not have the two in house at the same time so could not make direct comparisons, but I have a feeling that the Hi End is a little extra smooth and the Supreme is a little more accurate. Both are musical and should be good options. Thanks for your elaborate insight in the Audioquest cables. What appeals to me very much is your analysis of the Castle Rock cables being very lifelike, with an enveloping auro that fills the room. Especially your qualification of musicians being in the mood draws my attention because that’s exactly what I am looking for. In that respect I was investigating the dearer models in the sames series of the Castle Rock: the Comet, Meteor and K2. The K2 has a solid silver core and my question is wether one can say in general what the characteristics are of solid silver and solid copper cables ? 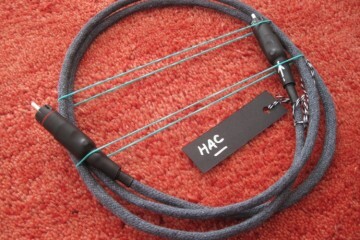 The cable’s geometry and jacket material has more to do with a cable’s sound than the base material. That said, the base material does have an influence of course, especially when using plated materials. Pure copper vs pure silver is not a clear cut case. The latter can sound more detailed and open but copper tends to sound warmer and more colourful. However, the myth that silver is sharp/etched or harsh by definition is not true. Silver can absolutely also sound very fluid and smooth. It depends on the geometry, material mix and plating. Darker: sure, that can be related to the gold plating. Dryness, however, is not a trait that I associate with a gold plating. Rather I think this is caused by its internal configuration. I have tried the GO-4s, and have decided to purchase the the Aspen Tree series, what should I be looking at for quality of sound compared to the Go-4s? I’m not sure that I understand what you’re asking me Brad.